In a democracy, all citizens—the rich, middle-class, poor alike—must have some ability to influence what their government does. Few people would expect that influence to be identical: those with higher incomes and better connections will always be more influential. But if influence becomes so unequal that the wishes of most citizens are ignored most of the time, a country’s claim to be a democracy is cast in doubt. 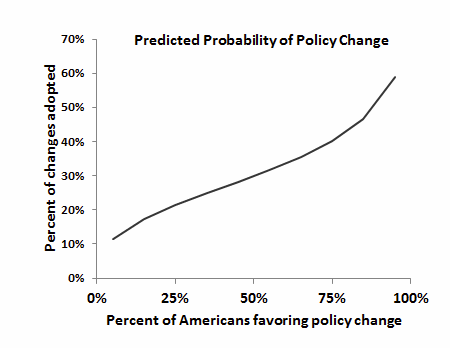 And that is exactly what I found in my analyses of the link between public preferences and government policy in the U.S. In my recent book, Affluence & Influence: Economic Inequality and Political Power in America, I examined thousands of proposed policy changes over the past four decades. I compared the strength of support (or opposition) of survey respondents at different income levels with actual policy outcomes in the years following the survey. As expected, greater public support increased the likelihood of a proposed policy change being adopted, as shown in the first chart below. 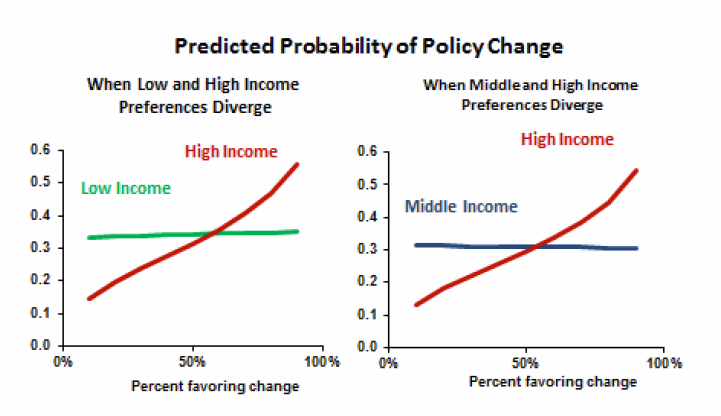 In many areas of government policy, the preferences of lower and higher income Americans are similar, and in these cases, the strength of the policy/preference link is necessarily similar as well. I found little difference by income level for about half the proposed policy changes in my dataset, including most aspects of defense, environmental policy, the war on drugs, family leave, and even antipoverty policy (where, for example, the affluent and the poor alike support strengthening work requirements, job training, and child care for welfare recipients). Affluent Americans tend to be more liberal on moral and religiously charged issues like abortion and school prayer, and more conservative on redistributive economic issues, government regulation, and trade policy. If federal policy more equally reflected the preferences of all Americans, we would see a more progressive tax structure, higher unemployment benefits, stronger regulation of business and industry, a more protectionist trade regime, more prayer in public life, and less access to abortion. On many of these issues, the difference between the affluent and the poor reflects differing degrees of support or opposition rather than a difference in the majority preference. But as the charts suggest (and as I discuss at some length in the book), differences of degree can be as consequential, if not more consequential, than differences in majority preferences. A policy with weak support is modestly more likely to be adopted than one with weak opposition, but a policy with strong support is considerably more likely to be adopted than one with weak support. These findings suggest that political representation functions reasonably well for the affluent. But the middle-class and the poor are essentially unrepresented (unless they happen to share the preferences of the well-off). In a second post tomorrow, I’ll discuss my more hopeful findings that reveal the (less typical) conditions under which government responsiveness to public preferences is stronger and more equal. Is Paul Ryan Really the Most Conservative Vice-Presidential Nominee? What effect does education have on voters’ policy preferences being enacted? Good question I’ll discus that briefly in my third post. Just by intuition, I’m betting this shows that we avoided some nutty populist stuff in trade and other economic areas. How did you measure specific preferences across income groups ? How did you measure specific policy outcomes ? What was your estimated margin of error in those measurements ? In what percentage of your cases do a majority of high-income voters disagree with a majority of middle- or low-income voters? You note that there seem to be large differences on specific issues (religious and redistributive issues). I’m wondering if you have repeated observations within any single issue category and if you can use this to speak to the robustness of these results. For example, if you have five cases of policy change on abortion, in how many of these cases did income groups disagree and in how many did the high-income group “win” the debate? I second Reinhart’s questions. Also, if available, it would interesting to see the distribution of preferences across the entire income distribution (ie, not only 10-50-90th percentiles). Also, my understanding is that many (most?) citizens hold a number of policy positions that are contradictory (if they have ‘true’ policy positions at all). And relatedly, how do you account for the intensity of people’s policy preferences? Ie, many people simply don’t care at all that much about policy outcomes. In any case, fascinating work and I look forward to reading your future posts. Lots of great questions. I’ll try to address some of them in my next two posts and also link to my more extensive discussions of those issues. +1 on all questions/requests/comments that eventually rely on being able to access the data, especially since both scales are constructs. To engage fully with the topic and research, it would be so helpful to be able to look at the facts in parallel. Yeah, jeez, it’d be awesome if he’d written a book or something about this, where he explains in more detail his arguments and data. Have you read THE PRICE OF INEQUALITY by Professor Joseph Stiglitz? He is working in the same area except that he emphasizes the economic system and its contribution to increasing inequality.